The first clue was obvious: The signs on the trees. Wow, a close-up view proved to be very exciting.The lower sign reads "Long Island Motor Parkway Lodge Entrance." 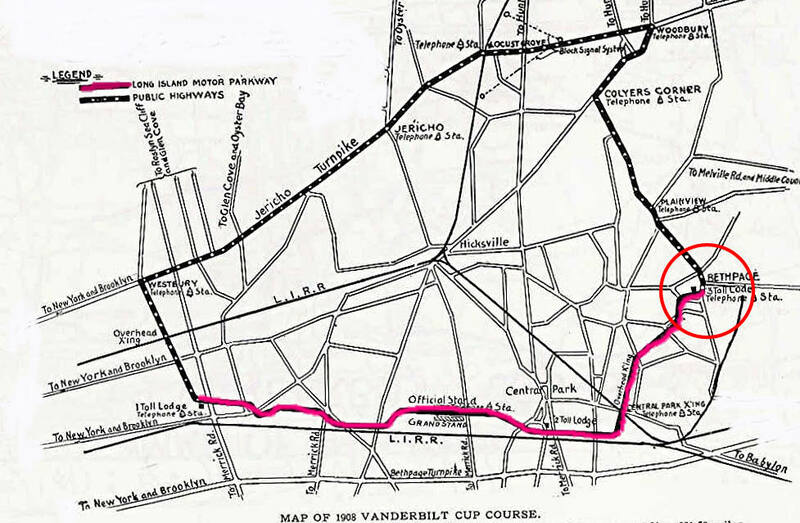 This meant the time frame of the photo was between 1908 to 1910 when the Motor Parkway was part of the course. Moreover, there were only three lodges on the course; the Meadowbrook Lodge (off Merrick Avenue), the Massapequa Lodge (off Massapequa-Hicksville Road and the Bethpage Road (off Round Swamp Road). A closer look of the two mileage signs above the Lodge sign indicates the location was 4 miles from Hicksville and 4 miles from Jericho....about the right distance from Bethpage. The second clue was the telephone poles. Clearly, this section of the course was a turn on to a public road. Other clues were the trees and hills in the photo. The Meadowbrook Lodge and Massapequa Lodge were very much in the flat Hempstead Plains with barely a tree or hill in sight. 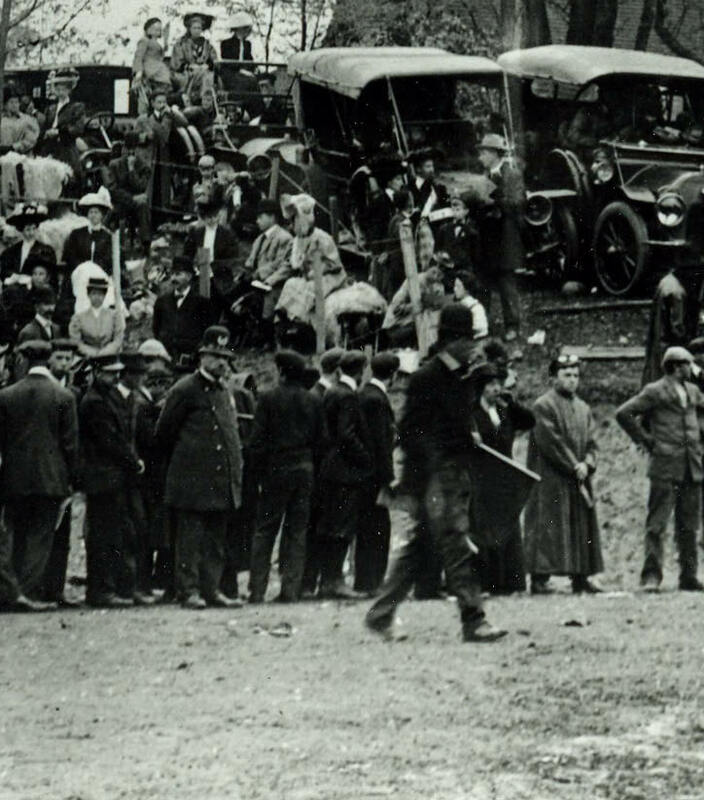 Accordingly, I believe this photo is a very rare view of the 1908 Vanderbilt Cup Race from Round Swamp Road in Bethpage, the eastern terminus of the Motor Parkway in October 1908. As indicated by the direction the flagman, police officer and crowd are looking, the racers were coming from the right and making the left turn on to Round Swamp Road. 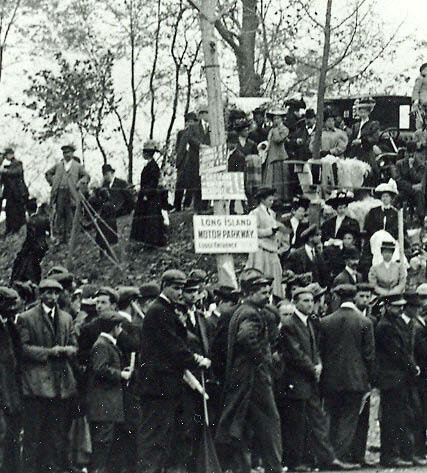 Also note the cars parked on the slope in the background. 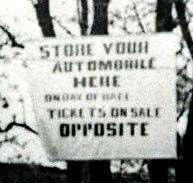 The owners of these cars likely saw the signs hanging on the road: "Store Your Automobile Here On Day of Race. Tickets on Sale Opposite." Looking at the 1908 Map, can you identify the roads the LIMP crossed. Here is my stab at it? I will photos of these bridges sometime this month.